The Rap Sheet: Bill Crider, R.I.P. My brother, Bill Crider, passed away this evening at 6:52 p.m. CST, Monday, February 12, 2018. It was a peaceful end to a strong body and intellectual mind. Is it any wonder that media profiles of this Alvin, Texas, author so often referred to him as “prolific”? 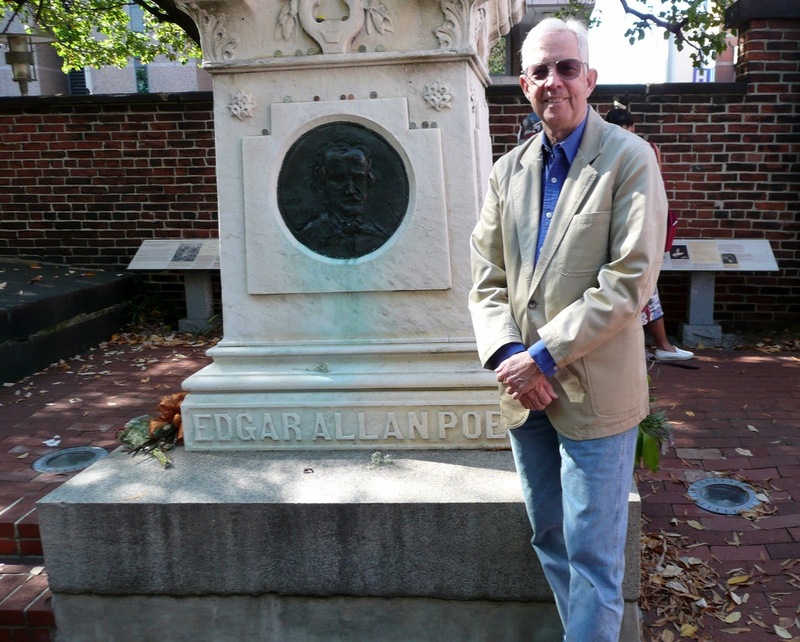 Bill Crider poses in front of Edgar Allan Poe’s grave during Bouchercon 2008, held in Baltimore, Maryland. Born in Mexia, Texas, on July 28, 1941, Bill Crider—cat lover, vintage music fan, all-star book collector, movies enthusiast, ardent blogger, voracious reader, poseur old grouch (his “Keep Off My Lawn” posts were persistently enjoyable), certified Dr Pepper addict, and the Web’s most popular authority on alligators and crocodiles—was 76 years old at the time of his demise. He outlived his wife, Judy, by slightly more than three years, but never forgot what it meant to be so loved. READ MORE: “Bill Crider,” by Jacqueline Carmichael (Mystery Scene); “Bill Crider (1941-2018),” by Jerry House (Jerry’s House of Everything); “Interview: Bill Crider,” by Ben Boulden (Gravetapping); “Bill Crider, and Some of His Work and Play, Including Some Short Stories: The FFB Crider Celebration Week” (Socialist Jazz). Very nice post, Jeff. Bill will be very much missed. He was exactly the man everybody says he was. Bill's Pop Culture blog was something I checked several times a day. The Internet is not always a positive influence in one's life, but the fun his posts provided, including facts and reviews, were always small islands of joy, no matter how bad a day I might be having. Missing that blog in such a surprisingly profound way tells me how overall a great loss Bill's passing is. But how glad I am that he passed our way. Well said, Jeff. Bill was a true gentleman. When my wife passed a few months after Judy, Bill was one of the first from the mystery community to reach out. He offered his ear, his shoulder, and his heart, and that meant the world to me. I second Collins's comment. Crider's blog was a very big deal to me. I relied on him for entertainment, insight, and recommendations.